Still have questions about volunteering for Alpha Sigma Alpha? Take a look at some frequently asked questions below. What will I get out of my volunteer experience? As an Alpha Sigma Alpha volunteer, you will have the opportunity to learn new things and develop as a leader. Personal and professional development are important key skills to continue growth after graduation and as a volunteer, you have this opportunity through various training and networking opportunities. Am I qualified to be an Alpha Sigma Alpha volunteer? Yes! While there are special requirements for certain positions, we encourage all alumnae and non-members to fill out a volunteer interest form. It doesn’t matter if you served as an officer in your undergraduate career or not, there are various opportunities to get involved, no matter your stage in life! No, any Alpha Sigma Alpha alumna or non-member can volunteer immediately following graduation. However, we ask that all advisors be at least three years out of college. You can learn more about advising a collegiate chapter here. How much time will my volunteer role take? Each volunteer opportunity requires a different time commitment, from a one-day commitment to an in-person weekly commitment. Alpha Sigma Alpha wants to meet our members where they are in their lives, even if you have a busier schedule there is an opportunity for you to get involved! Will I receive training and support in my volunteer role? Yes, we want you to feel as comfortable as possible in your volunteer role! 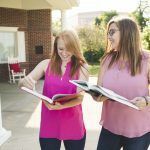 All Alpha Sigma Alpha volunteers receive proper training and support from their supervising volunteer or national headquarters staff. This support ranges from conference calls and webinars to online resources. Alpha Sigma Alpha also hosts national training events for all our volunteers that focus on professional development and operational training. These training opportunities include Advisor Institute and Region Volunteer Development Weekend. Learn more about our national volunteer events. Can non-members volunteer for Alpha Sigma Alpha? Of course! Non-members can volunteer as a collegiate chapter advisory board member or become a workshop facilitator at one of our national events. Do region volunteers have to live in the region they are volunteering? No, region volunteers are no longer required to live in the region in which they serve. Volunteers will be placed based on their experience and the needs of the region. With technology like Skype, Google Hangouts, webinars and conference calls, the need for in-person interaction on a regular basis is not necessary, so a volunteer can live further from the members they support. Learn more about region volunteers. Do advisory board members have to live near the collegiate chapter they are advising? Yes, it is preferred that advisory board members live within a 60-mile radius of the collegiate chapter he or she is advising. This is different than our region or national volunteers because serving as an advisory board member requires an in-person commitment. Advisory board members mentor and coach collegiate chapter members and are required to be at certain events. Learn more about advisory board members. I’m interested in advising but am not in contact with a collegiate chapter. How do I get in contact with one? Please fill out a volunteer interest form indicating your interest to become a ‘chapter advisory board member’. Once you select this option a second question will appear that asks if you are in contact with a collegiate chapter. The volunteer coordinator will then connect you with a collegiate chapter nearby. Can I serve in multiple volunteer roles? Alpha Sigma Alpha does have a dual placement policy that encourages single placements of volunteers. Dual placements may create conflicts of interest and redundancies that make our system less efficient. For example, if you are an advisory board member for a collegiate chapter you are unable to serve in a region volunteer role. Additional questions should be directed to Ali Harris, volunteer coordinator.